Just a little over a month ago, my wife, oldest grandchild, and I spent several days in the Gulf coast area that was devastated by Hurricane Katrina on August 29th. We were returning home from a trip to Washington, D.C. and decided to stay along the Gulf coast and then visit New Orleans. We first took a tour of Gulf Shores, Alabama and visited the Battleship Alabama in Mobile before continuing our drive to a hotel in Gulfport, Mississippi. The two days there and a full day visit to New Orleans were very enjoyable and memorable, especially for our 10-year-old grandson. I can easily remember him standing in the shark mouth entrance to a souvenir store (photo on the right) on the shore side in Biloxi, wading with him and my wife in the placid waters of the Gulf of Mexico, and walking with both on the white sands of the Gulfport beach. He even enjoyed the hours in New Orleans, especially walking on the levee of the Mississippi River on the way to visit the aquarium that is near Jackson Square and eating the “freshly made powdered doughnuts” that are a must while in the French Quarter, regardless of your age. Sadly, I also remember commenting to my wife and grandson about what could happen if a storm similar in strength to Hurricane Camille or even Hurricane Ivan was to hit directly or very near New Orleans. Yes, my grandson peppered me with all types of questions concerning destruction and death . 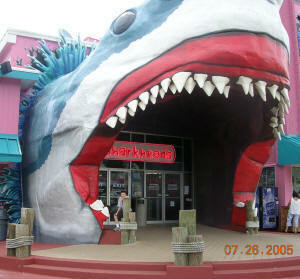 . . including what would happen to the souvenir store with the shark mouth entrance. Well, my thoughts about “what if” have been realized with Hurricane Katrina. This devastatingly destructive storm was a worse case natural disaster, which is self-explanatory in viewing and reading the media reports of its aftermath. It even had a lower barometric pressure than Hurricane Andrew did upon landfall and was significantly larger. Thankfully, the healing can slowly begin in the devastated Mississippi area along with those severely hit along the Alabama coastline . . . with the clean-up process occurring almost immediately. Unfortunately, Hurricane Katrina's fury unleashed on the New Orleans area brought the feared result . . . severe flooding with all that comes with it including the fear that hundreds to thousands have died. And being below sea level . . . means the water has nowhere to go without manmade means. So, it could be at least a month before any real clean up can start (then followed by reconstruction) . . . as repairing the damaged levees and removing the water through functioning pump stations must occur first. Moreover, all must occur without setbacks from any significant rain event or worse occurring during this period. And it could have been even more dire for the New Orleans area if Hurricane Katrina made a direct hit instead of passing slightly to its east . . . A direct hit would have most likely caused immediate heavy flooding of the entire city and killing thousands more of those who survived her brutal brush. Now, there are questions that come to mind that I dislike even mentioning, but must do so when thinking about the next Katrina or Camille making a direct hit on the New Orleans area and what will be the cost in lives alone. What is the best thing to do from a national perspective for all who call New Orleans home? Can it be rebuilt with a levee system able to withstand a direct hit from a category 5 hurricane let alone a near miss by another Hurricane Katrina? And if so, how long will it take with the interim danger of the same or worse happening again? Should national treasure be spent to rebuild knowing it will happen again or worse under similar conditions that occurred with Hurricane Katrina? Or should it be rebuilt above sea level elsewhere and let nature take its course where it now stands? For now, my prayers go out to all my fellow citizens who have been affected by the Hurricane Katrina nightmare that has become a national tragedy . . . along with a request that you do the same . . . and if you can, provide a cash donation and/or become a volunteer to one or more of the charities involved in the relief / recovery process. In memory of the anniversary of September 11, 2001, please honor in some way those who died as a result of the terrorists attacks on this day and since . . . including all the valiant American and allied troops who have served proudly since then and none more so than all who paid the ultimate sacrifice and suffered disabling wounds.